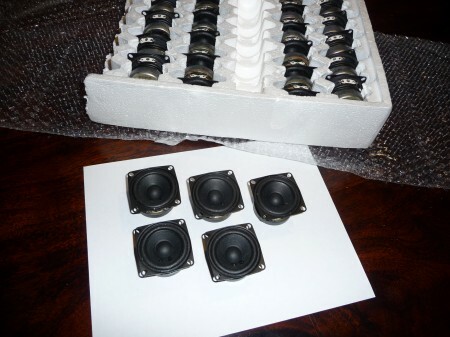 The first batch of 25 speakers for the WFS array has arrived. These will go into a mini-array configuration for testing nearfield listening. I bought these 4 ohm, 2" drivers from a distributor that happens to be in southern Florida. Cost per unit ? manufacturer ? Oh sorry - I see the link now. I am building a small wfs setup - I would love to see the plans and what are you powering the spealers with ? Mini, 2" , Foam edge, paper cone speaker with 1oz. ferrite magnet. I am powering the speakers with Sure Electronics stereo 8W audio amplifiers from Parts Express.